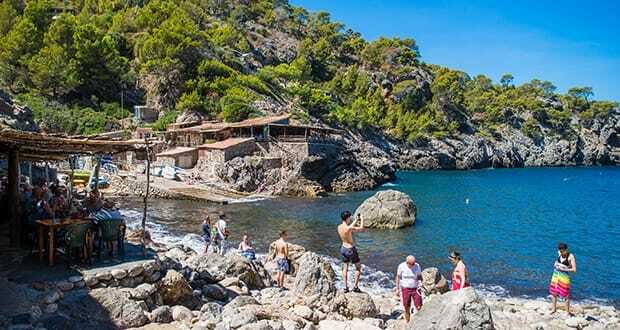 Cala Deia is a tiny, cove beach just outside of the much loved mountain village of Deia, in the heart of the Tramuntana mountains in the northwest of Mallorca. The beach is only about 70-meters long and is mostly small pebbles and large rocks. People perch themselves along the surrounding cliffs and rocks like lizards, coming to enjoy the clear, green-blue water, the majestic surroundings of mountains and stone houses, and good food. 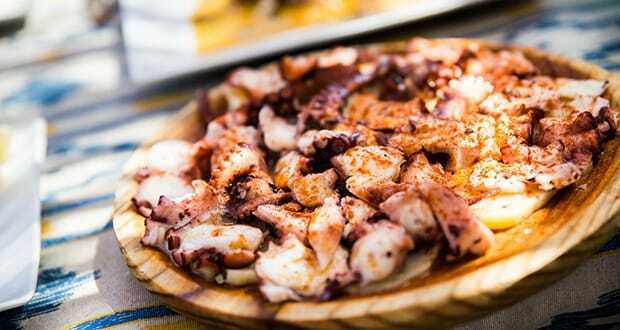 There are two restaurants on Cala Deia both offering good quality food including fish, paella, tapas and the like. One is known to be a favourite of visiting celebrities. It is not really a family beach as there is no sand and jellyfish sightings in peak summer months are frequent. It is well visited by locals and tourists, particularly Germans. There are no umbrellas or lounge chairs nor are there any water sports activities here. There are toilets and showers. Cala Deia is about an experience- coming to this rather secluded, though popular location for its charm, history and friendly, hippy vibe. There are often vendors selling tapestries, handmade jewellery and crafts. Cala Deia can be reached by car and there is a small, paid parking lot if you arrive early enough to get a space. Otherwise, park in the village of Deia and walk down the road about 3 kilometers in order to arrive to the beach. This would be a difficult beach to access with a wheelchair. Cala Deia a great place to anchor a boat and it is a very popular thing to do for the day. There is no lifeguard on duty here and first aid access is minimal. Swimming, snorkeling and diving are favourite activities on Cala Deia, but you need to bring your own equipment as there is no shop to rent it from on the beach. Some people also bring SUP boards as well. Many enjoying walking along the cliffs and the surrounding landscapes, going into the cliffs and wandering up to the former pirate tower. It is not particularly a comfortable beach for lounging, at least not for too long. 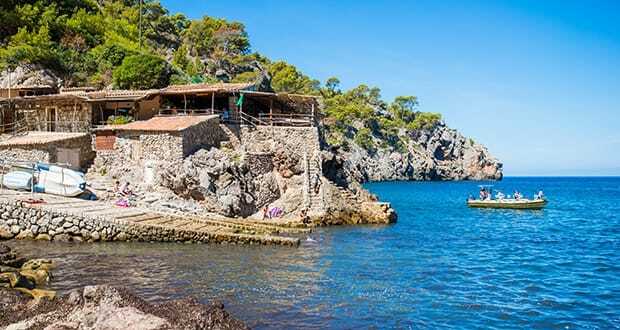 There are two well-known and well-liked restaurants on Cala Deia. Restaurante Ca’n Lluc, which sits right on the beach and features good, classic Mallorcan and beach-inspired food such as paella, grilled fish, salads and tapas. It’s friendly and casual and you can’t beat the view. The other, Ca’s Patro March sits a bit further up on the cliffs and offers a more of an upscale menu, focused on fresh fish and shellfish, though there are some meat dishes as well. Now famous for being a location in the TV thriller, “The Night Manager,” it is recommended to reserve in advance and plan to have a leisurely meal. 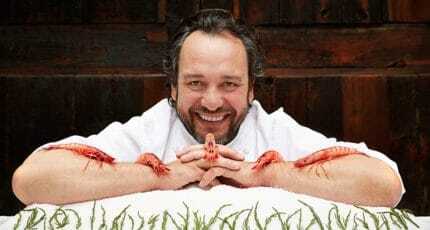 It is also open for dinner in July and August, mostly enjoyed by those out on boats. Deia itself is full of some fantastic restaurants with many different cuisines and styles. There are no hotels on Cala Deia. For accommodations, you’ll need to head back up to the village of Deia, where most of the hotels and private rentals are in a higher price point than most areas because of the exclusive nature of the village. 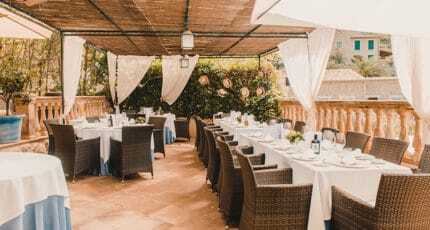 Belmond La Residencia is one of the top hotels on the island and worth visiting just for a drink. 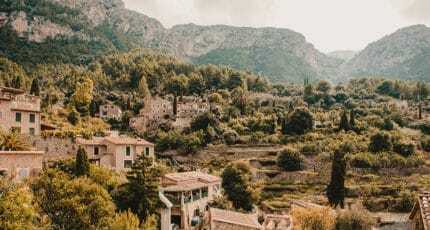 About 25-30 minutes by car is Sóller and Port de Sóller, where you can find many more options for staying the night from mid-sized budget hotels, to apartment rentals to boutique hotels and in the other direction, about 15-20 minutes is Valldemossa, a beautiful village with more of a selection hotels and vacation rentals. 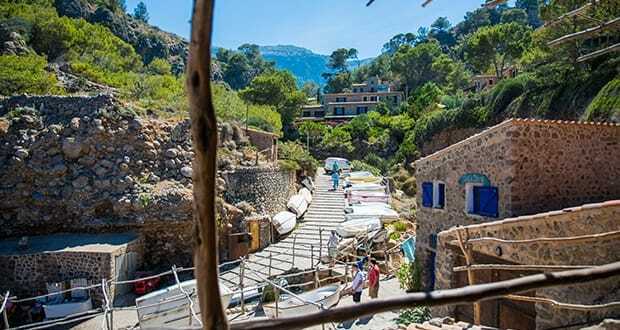 Visit the village of Deia, it’s tiny stone streets and beautiful church and tour the lovely home of famous English poet, Robert Graves, who made Deia his home for most of his life. This is the heart of the Serra de Tramuntana mountains and there are excellent hiking trails all around. 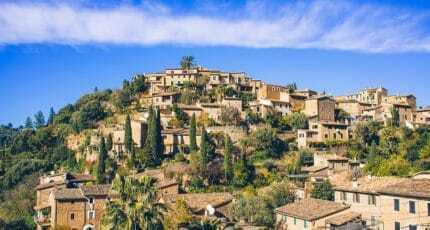 The charming and popular village of Valldemossa, about 15-20 minutes away by car, is famous for having been the place where George Sand and Frederic Chopin spent a winter. This mountainous village has a rich, cultural heritage, lovely cobblestone streets and many things to see and do. 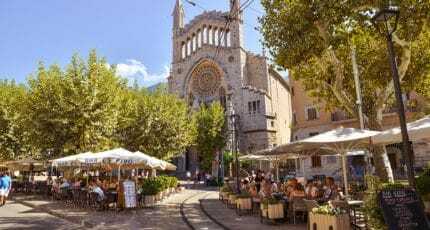 At a 25-minute drive, Sóller is a traditional village with a large church and central plaza, a couple of good museums, good restaurants, and a nice pedestrian shopping street and Port de Sóller has a long stretch of beach and a boardwalk with many good restaurants and shops. 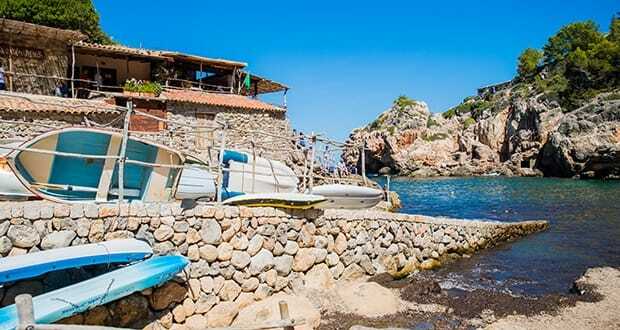 We hope you have found this article about the Cala Deià useful and that you have many memorable stays in Mallorca as a result of our recommendations.